India is perhaps the only country where on one hand we worship goddesses and on the other we kill our own daughters. Yes! If you thought this sentence is appalling, you'll be horrified to read the series of events that took place in the Jajpur district of Orissa. 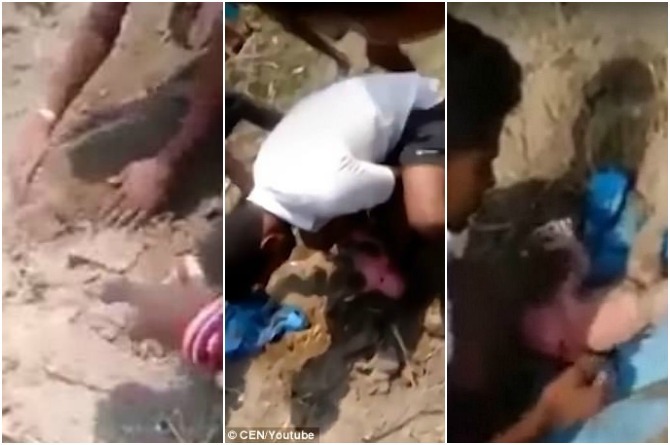 Reportedly, a newborn baby girl who was just six-hours-old, was buried alive presumably by her own parents. The baby was incidentally buried head first, which meant she was upside down. The horrible manner in which she was buried would have meant she'd be killed in just a few minutes, but as they say, where there is devil, there is also god! Apparently a few passerby saw the baby's feet coming out of the ground and got to digging her out. The residents of Shyamsundarpur in Jajpur district, Orissa, then managed to pull her put alive and rushed her to a nearby Community Health Centre (CHC. Luckily, the girl is in a stable condition. In fact, while the villagers were pulling her out of the hole, she was heard crying loudly (an indication that her breathing and senses were working fine). The brave heart hero, Alok Ranjan Rout, who rescued the baby spoke to the media after the baby was taken to the hospital and narrated the episode. He also shared how he pulled the baby girl out of the hole and what exactly helped them identify that it was in fact a baby. “It was a little kid who first saw the feet of the child buried under a compost dump in a field. Later we rushed to the spot and rescued the newborn girl,' he shared, adding, "The baby was buried upside down. She was wrapped in a cloth. We found two small feet above the ground and believed that the baby was alive." The medical officer at the community health centre added that the girl was fairly young, just a few hours old and was critical when she brought in. “An ASHA worker of Anjira panchayat came to the CHC with the rescued baby girl. The newborn is believed to be between 04 and 06 hours old. The girl was in a critical condition. We immediately started her treatment and stabilised her condition,” revealed Chintamani Mishra. The police officials investigating the case mentioned that they have filed a case against the missing parents and that it clearly looked like one of female foeticide. A video of Rout rescuing the baby girl was released by a leading international daily. The disturbing video is proof of the neglect, humiliation and detest Indian girls go through even today. Even though this incident took place in a village the fact is that most urban parents also still prefer boys over girls. As per the report by the India Human Development Survey (IHDS), conducted jointly by researchers from University of Maryland and National Council of Applied Economic Research, New Delhi, most Indian parents still prefer boys. The survey, however, found that a large percentage of Indians wanted at least one daughter. The survey is a small way to identify the social stigma associated with having and living with a daughter, a reality India still lives with even in this age. Read: Shocking! Why are Delhiites killing their own daughters? Preity Zinta's selfie with 'pati parmeshwar' Gene Goodenough is the cutest thing you will see today! Did this 2-year-old need to die at the hands of his own mother?